This week the Digital Scholarship Lab at the University of Richmond has unveiled its latest project, a digital version of the landmark Historical Atlas of the United States, published in 1932 under the direction of Oscar Paullin and John K. Wright. As Ed Ayers has observed, since then nobody has undertaken a historical atlas quite so ambitious, and the DSL aim is twofold: first to bring the Atlas to the digital age by georectifying its maps and giving them an online life; and second to launch another, original, effort to create an online historical atlas with a similar ambition. 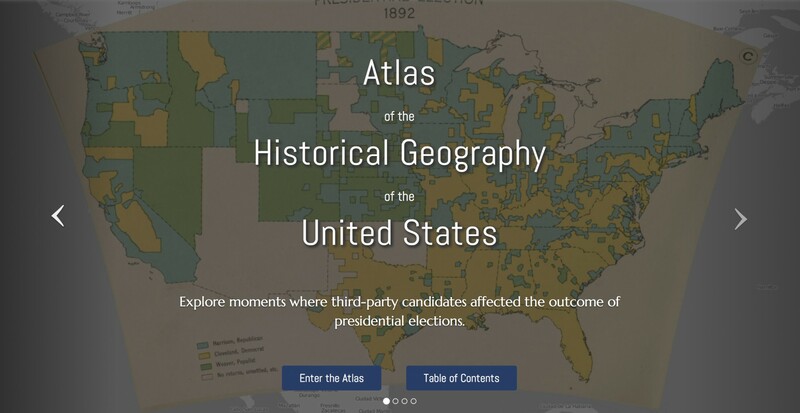 I wrote about the 1932 atlas in chapter two of Mapping the Nation–it was a landmark achievement that took over twenty years to complete, with dozens of contributors from government agencies, research institutions, and universities–including geographers, statisticians, historians, and economists. Jenny Scheussler at the New York Times has written a nice review of the digitization project. I plan to post another piece about the atlas in coming days, but for now just want to say congratulations to Scott Nesbit, Rob Nelson, Ed Ayers, and the entire team at Richmond!